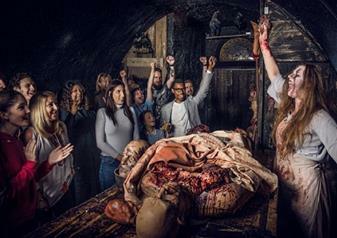 Immerse yourself in the gruesome London Bridge and London Tombs experience! Discover the deadly secrets that linger beneath the bridge, hear terrifying tales of London through history and see, hear and smell what old London Bridge was like. When you wander the ghostly site, be sure not to engage in any traitor behaviour if you want to keep your head. The Keeper of The Heads lurks and after all, he’s accustomed to dealing with blood-splattered body parts! Have your wits about you as you adventure through old London as Jack The Ripper and Ben Crouch await in the darkness. Visit the Chapel of Thomas Becket who was brutally murdered in Canterbury Cathedral before being swept into the hellish depths of the London Tombs. This ghostly experience promises to send shivers down your spine with walls soaked in blood, terrifyingly small spaces and a whole host of sinister and evil beings that you should avoid at all costs! There’s a special children’s tour available called the Guardian Angel tour where zombies are kept at bay as children are led by their very own Guardian Angel.